LOS GATOS -- Los Gatos-Monte Serreno police arrested a man Thursday in connection with the disappearance of a woman from this upscale San Jose suburb more than three years ago. "We reached this point by never giving up," police Chief Scott Seaman said. He said the case had been "our highest investigative priority, because it is a homicide. ... It is a case that has touched this community and this department." Maurice Nasmeh, 40, is being held without bond for the murder of Jeanine Harms, a 42-year old Los Gatos resident last seen purchasing beer with Nasmeh at a convenience store on July 27, 2001. Early in the investigation, Nasmeh told police he had met Harms at a Los Gatos brewery earlier in the evening and returned with her to her home where they drank beer for a few hours. He said that she was asleep on her couch when he left. Police believe Nasmeh killed Harms in her home late that night or early the next morning and removed her body, purse and several other items, including a large Persian rug. Harms's body has never been found. Police said a break in the case came in April 2003 when police publicized a picture of the rug. A woman then came forward and said she found a similar rug rolled up under a trash bin in San Jose, about a half-mile from Nasmeh's residence. Forensic tests detected fibers on the rug that matched fibers found in the cargo hold of a Jeep police believe Nasmeh used to dispose of Harms's body and the rug. "That was really a miracle that this lady found the actual rug and then called us up and told us, `here it is,"' Los Gatos police Detective Stephen Walpole, the lead detective in the case, told the San Francisco Chronicle. Nasmeh was arrested Thursday morning as he left his home. "This has been a very long investigation," Assistant District Attorney Karyn Sinunu said. "It's such a relief to have this wrapped up. The family is very happy." Defense attorney John Hinkle told the Chronicle that Nasmeh was "an upstanding member of the community," and that "any case that could be made ... will be the weakest form of circumstantial evidence." 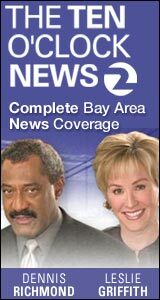 Copyright 2005 by KTVU.com. The Associated Press contributed to this report. All rights reserved. This material may not be published, broadcast, rewritten or redistributed. The president says the federal assistance will include FEMA distributing $2,000 debit cards so evacuees can buy food, clothing and personal items. * Click here to download! KTVU/KICU EEO Information Click here for advertising information.